It will be able to chambered into a Rem 700 with no obvious problems, except it will be unable to be magazine fed. 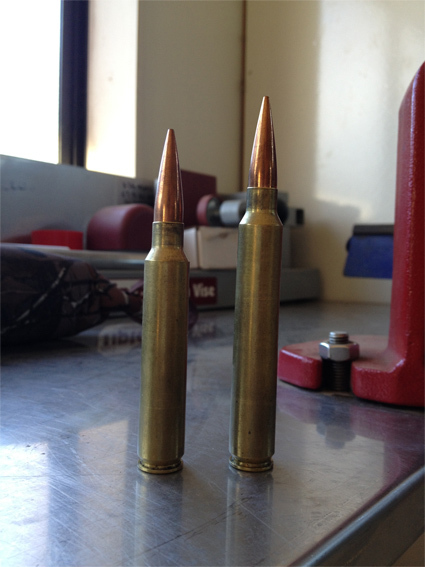 Performance will fall between the 338 Lapua improved & 338 Cheytac. Last edited by Kiwi Greg; 26-01-2013 at 04:59 PM. Spanners, Terminator, 199p and 2 others like this. I'll have one. I'll send you a trued short action an stock you get it all fitted up for me? I'll do loads etc you give me starting points an what you use? I don't know if it will fit into a SA, I will have to have a play when I get a couple back from fluting. Feel free to pop in and see me next time you are in town & we can discuss the build. If it's single feed may as well be rate weight on a long when it's not needed. New case as in you designed and had brass made or improving an existing case? Maybe like something i have been playing with? Would it work in a SA rem700 if you took the bolt out to extract the round? Do you have to take the bolt out of the LA to get the round out anyway? What about the thrust on the locking-lugs, it must be getting up there? I will have a play with a SA, but loading a live round through the port will probably be an issue. You can load & extract cases out the LA port but you can't extract a live round without removing the bolt. It is a std magnum bolt face so shouldn't be too hard on the lugs if sensible pressures are run. The brass in pretty tough & as usual if it is formed properly there shouldn't be any issues.